Join Us for Free Socialization, Entertainment, Food, Exercise, and FUN! 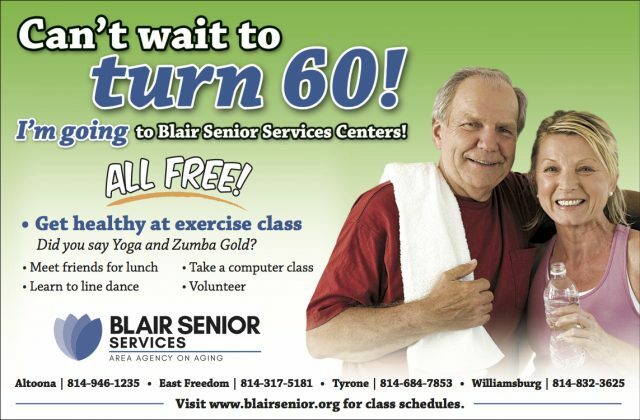 Blair Senior Services, Inc. runs four senior centers located in Altoona, Tyrone, East Freedom, and Williamsburg. These centers are open during the week to all adults age 60 and older. There, visitors will find plenty of opportunities to socialize, participate in learning and entertainment activities, eat, and exercise. The centers offer a variety of exercise classes, including Zumba, Yoga Fit for Seniors, Body Sculpting, Zumba Step, Stability Ball Fitness, and Fitness Jams. These types of classes can cost hundreds of dollars a year at fitness clubs, but at the Blair Senior Services, Inc. Senior Centers, they are totally free. Dance Classes, Dinners, Parties, and Karaoke for Seniors Only! In addition to exercise classes, the senior centers provide a wide variety of fun, informative, and engaging programs for people with diverse interests. These programs include entertainment by local musicians and performers, dance classes, informative medical presentations, special dinners and luncheons, themed parties, guest lectures, karaoke, festivals, holiday celebrations, and charity events. No matter your hobbies and interests; the senior centers in Blair County are bound to have several programs every week that are perfect for you! The senior centers also provide hot nutritious meals daily. While walk-ins are always welcome, we encourage you to guarantee your meal by making a reservation. Just call the appropriate senior center by 12 pm noon on the day before you plan to attend. Please click here to view our current lunch menu.